After learning the history of McNair Evans’s Confessions for a Son series, I was immediately drawn to the photograph Christmas Morning, 2009 in the exhibition Southbound: Photographs of and about the New South. The series is a collection of images taken shortly after Evans father had passed. This particular image was captured at his grandmother’s home in North Carolina on Christmas Morning. The scene depicts an abandoned game of solitaire Evans’s mother had been playing the previous evening. The photograph Christmas Morning not only captivates through content but also aesthetics. The color palette of soft blues, oranges, and violets serve as compliments to each other and act as a respite for the eyes. The composition itself is mature and intricate. The lines of the table produce horizontals, verticals, and diagonals that weave viewers’ eyes through the space, circulating one’s gaze around the photograph. The photograph addresses how the South views times of mourning. There are often stereotypes of Southern men and women being emotionally reserved, keeping personal matters behind closed doors. The stereotype is not entirely wrong. Growing up in the South, it seemed as if grief could be cured with a warm meal in a casserole dish and a prayer. This photograph serves as an intimate glance into what happens behind closed doors and what emotions we might not let come to the surface. 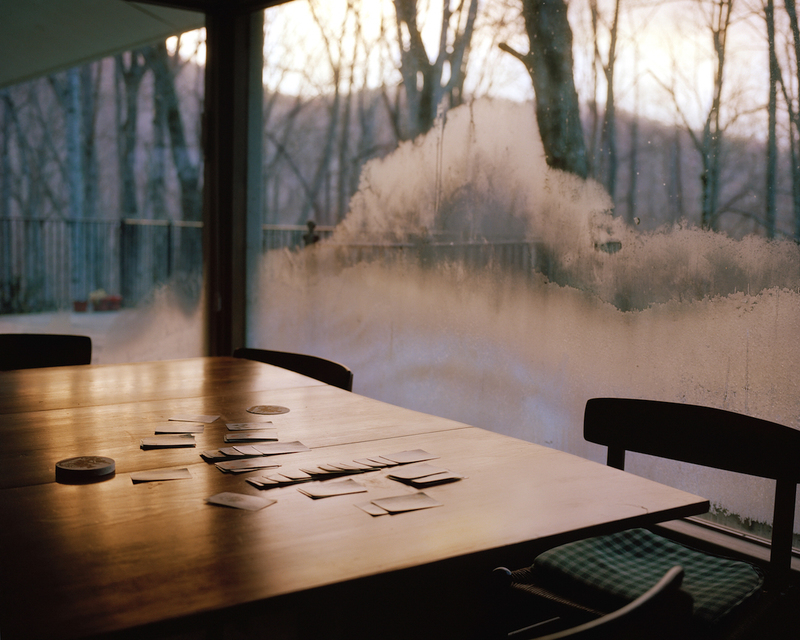 image credit: McNair Evans, Christmas Morning, 2009, from the series Confessions for a Son.